Big and thick, these Chunky Walnut Chocolate Cookies will satisfy every chocolate craving. Stuffed with dark chocolate, white chocolate and chopped walnuts, they’re the best chocolate cookies ever. 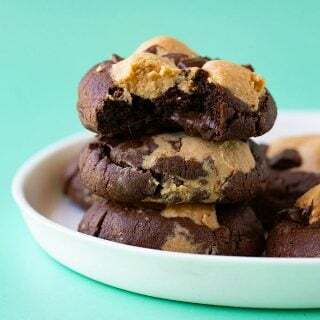 The cookie of your dreams is HERE. It’s big. It’s bold. And it’s packed with chocolate. Introducing my Chunky Walnut Chocolate Cookies, otherwise known as the best cookies EVER. Extra thick, extra gooey and completely irresistible. I’ve had cookies on my mind for a while now. But I didn’t want to make just any cookie. I wanted a really, really chunky cookie packed with all the good things in life. Perfect for morning tea. Perfect for dessert. Perfect for EVERYTHING. 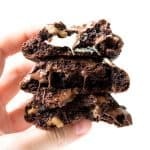 Reminiscent of a brownie, these thick and chewy chocolate cookies are deliciously lumpy and packed with crunchy walnuts, chunks of white chocolate AND dark chocolate. Boasting a sticky cookie batter rich with cocoa powder, these choc cookies are perfection. The secret to getting the height and deliciously soft texture of these cookies is a little extra flour and a dash of cornflour. And the gooey pockets of chocolate? My secret is chopping a chocolate bar by hand. This ensures each piece is a different size and shape. Meanwhile, the walnuts add flavour and crunch, and also make the cookies delightfully lumpy. These cookies have come at just the right time, making me very excited for Christmas and the baking season! 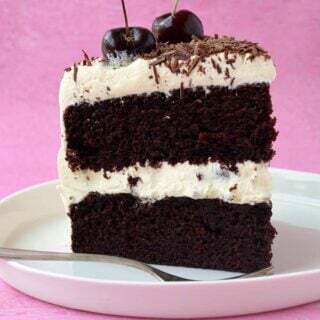 Tell me, what do you love to bake at this time of year? I’m getting ready to share a few new Christmas recipes with you over the coming weeks. I get seriously excited/obsessed about gingerbread at this time of year. In the meantime, these Chunky Walnut Chocolate Cookies are going to keep my cookie cravings under control. And yours too. Let’s eat! 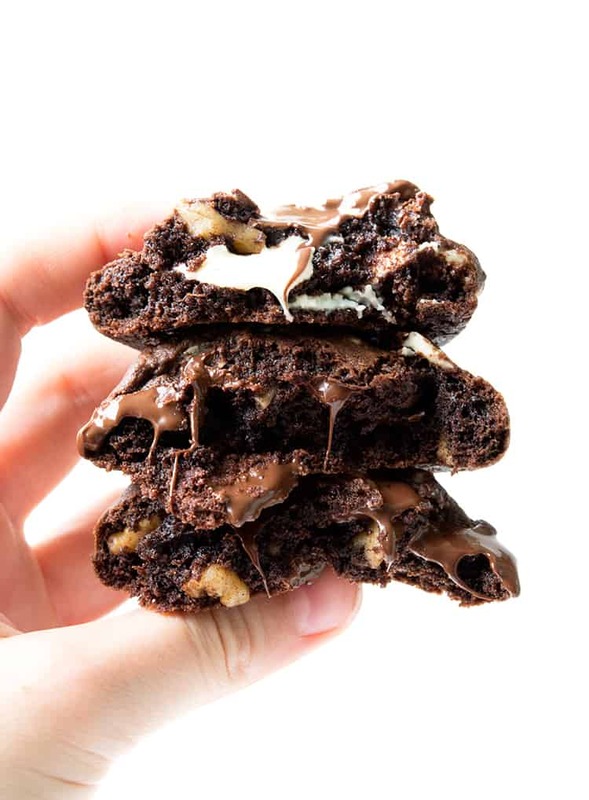 Rich and gooey chocolate cookies loaded with white chocolate, dark chocolate and walnuts. Preheat the oven to 180 C (360 F). Line two baking trays with baking paper. In a large mixing bowl, add the butter and sugars and beat with an electric mixer until combined. Add the vanilla and egg and beat for a minute or so until smooth. 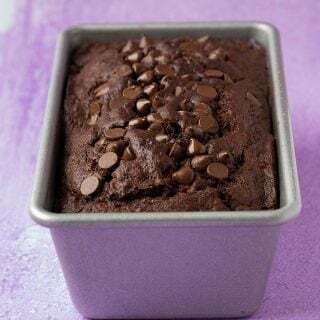 Sift in the flour, cocoa powder, cornflour and baking soda into the mixture, and stir until combined and forms a chocolately dough. Roughly chop the white chocolate and dark chocolate into small chunks. Coarsely chop the walnuts. Add chocolate and walnuts to chocolate batter and stir. Roll balls of the dough until smooth using your hands and pop onto the prepared trays. Place a few extra chunks of chocolate on top. Place in the oven and bake for approximately 10 minutes before transferring to a wire rack to cool. Hii i’m from the Netherlands and i love your recipes! I would love to try this recipe outt! They look perfect! I have one question,, how big do the ballss need to be?? Mabye in grams?? Hi! Great question! About 1.5 tablespoons of dough would be perfect! These cookies are delicious! Not too sweet and super chocolatey. I only used semi-sweet chocolate chips instead of including white chocolate chips and loved the way they turned out! Hey!! Your recipes look worth try😍 but I had a concern,do u have an egg substitute for this recipe?? Hi Surbhi! I’m sorry I haven’t tested this recipe without eggs or with an egg substitute. Looking very delicious wow . I will make my self and eat .